Its been almost six years since I have Inspiron N5110 and never before have I had problems with installing it, be it drivers or reinstallation of Windows. 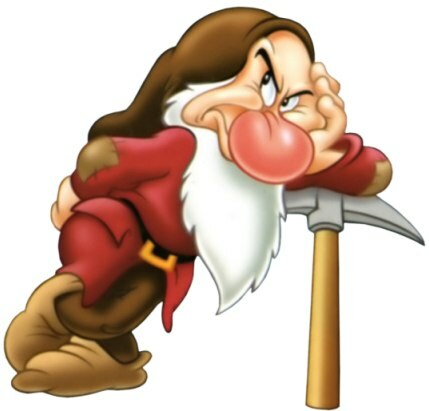 However, these days I reinstalled the system, Windows 7 x64, and I'm not able to make audio function. I tried the driver proposed by dell.com, it didn't work. I tried, also, other drivers, those failed too. Now, I don't know what's really a problem here, when I go to system (menage), apparently the audio is there, installed, however at the right bottom there's a red X clearly showing that the audio doesn't exist. As I said, this is the first time I am facing a problem like this and it's been two days since I'm trying to find a solution to it, but without success. Hello. If you "reinstalled the system" by reverting it to the original factory configuration (called the Factory Image on page 72 of the Setup Guide), and if the audio doesn't work after doing that, then the audio hardware has failed. If you "reinstalled the system" by using the System Recovery media that you created when the laptop was brand new (page 71 of the Setup Guide), and if the audio doesn't work after doing that, then the audio hardware has failed. If you "reinstalled the system" by using Windows installation discs, then the audio should have worked before you installed the IDT audio driver, because Windows 7 contains a native audio driver and doesn't need the IDT driver in order for the audio to work. Look in the Windows Sound dialog. On the Playback tab you should see "Speakers" or "Speakers/Headphones". If you see the words IDT High Definition Audio Codec then the IDT driver is installed. If you see the words High Definition Audio Device then the Windows native audio driver is installed. > Select 'Diagnostics' from the boot menu, then press the Enter key. Either the ePSA or the PSA tests will open -- it depends on the model of your laptop. > Look for a "Perform Quick Audio Check" button on the bottom right side of the ePSA main menu screen (see screen shot below). Press the button and listen for the beep tones from the speakers. > If you do not have the "Perform Quick Audio Check" button then do this. Start the PSA tests and when it performs the color test it will ask you if you see the color bars on the screen. Deliberately fail the test by answering no (press the "n" key) instead of yes. When you do that the PSA test will emit a series of beeps. Listen for the beeps. > If you don't hear the beep tones that means that the speakers have become disconnected or have failed. > If you do hear the tones that means that the speakers are working and are connected. In that case probably the reason that audio is not coming through them is that the sensing circuitry in the headphone jack has failed. When that happens it prevents audio from being switched from the jack to the speakers. The Headphone Jack FAQ has more details about this issue. 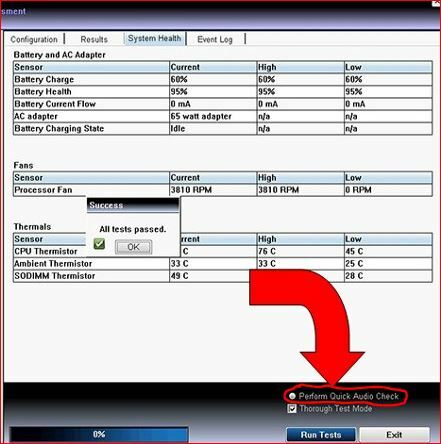 Here is a screen shot of the ePSA Quick Audio test, but If you have the older PSA test you will not have the "Perform Quick Audio Check." as shown here. In that case fail the color bar test. Thank you, Jim, for your answer. I did the test you proposed and its headphone jack that failed. Well, at the moment I'm going to put aside the possibility of changing it, seems like a quite a complicated thing to do. However, a possible solution I'd like to share with a community, I managed to have a sound from the computer by connecting speakers through Bluetooth. Helps going through, especially those who like music. at the right bottom there's a red X clearly showing that the audio doesn't exist. That is not a symptom of failed speakers. That red x plus the fact that audio test failed, probably means that the Realtek audio chip has failed. I doubt that replacing the speakers will fix your audio because the red x doesn't have anything to do with the laptop's speakers. 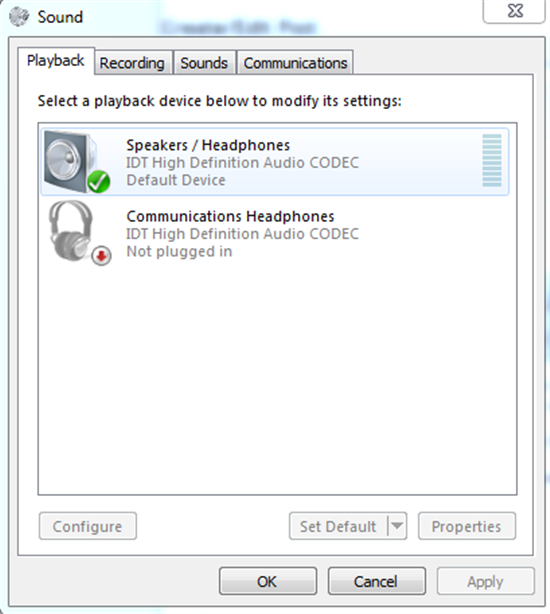 Bluetooth works because any Bluetooth audio device has its own audio component (DAC -- digital to audio converter) and doesn't use the DAC in the Realtek chip. in my opinion, you should update your Dell N5110 BIOS and reinstall windows that compatible for your system, and install audio drivers again, please note: don't turn off your computer while BIOS updating process, it may harm your computer. Rather than going through a third party site as in the post above, it's safer and simpler to go straight to Dell for drivers, though the diagnosis above is likely correct -- and drivers are not the issue.